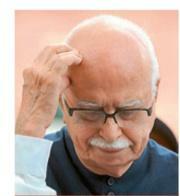 Adding to his party's confusion on the prime ministerial candidate issue, veteran BJP leader L.K. Advani on Sunday gave another twist by suggesting that a nonCongress, non-BJP Prime Minister was possible after the 2014 general election. This could also be seen as a glimmer of hope for Bihar CM Nitish Kumar, who has been consistently rejecting the projection of Gujarat CM Narendra Modi for this post. By suggesting such a PM could head the government only with the support of either of two national parties, whispers started doing the rounds that Mr Advani had done a deal with Mr Kumar. “If a government is installed at the Centre with BJP support, Mr Kumar, a JD(U) leader, getting the coveted post appears more likely,“ political analysts said.